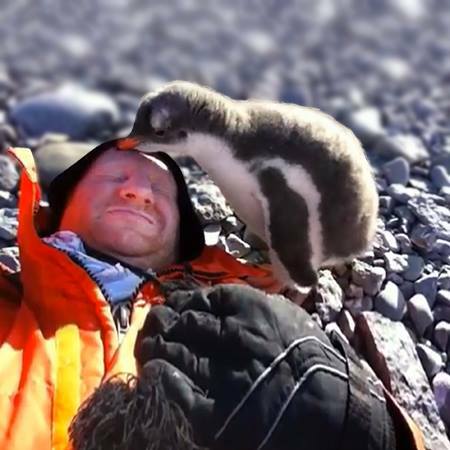 Behind the Scenes: Baby Penguin Meets Human for the First Time – Traveling Epic! On Saturday I noticed I was getting a bunch of comments on my baby penguin video, a video recorded from a SharePoint trip to Antarctica. I blogged about my travel, photos, and videos on a travel post Antarctica the final frontier. I’ve uploaded 80 videos to Youtube. Up to this week I was feeling a little better than average with over 100,000 views to my collection of travel videos and assortment of a few tech videos. Today I’m at a quarter of a million, and trending upward fast! I figured something had to have happened. I found a couple of clues that many of you might be interested in. 1. My video was listed on youtube.com/videos through a featured area called “Tastefully Offensive,” this is where my search for answers began. From there I found it was proudly displayed along with a number of other videos. The number of likes at that time in the hundreds made me realize it was getting an unusual amount of traffic. I can clearly see the number of views, but right next to the number I see a little stack diagram. Clicking on that… you can show video statistics. 4. Many would think that’s where it ends. It’s not. These sites helped spark off some larger ones. The media feed off of users and the liking, and commenting. When a certain volume gets reached, the video is seen as more viral. I have google search alerts setup for when my name or username is used on any web page and sure enough, I was notified when CBSNews posted a blurb about my video. 5. Today some very interesting email from a variety sources started flowing in. “I am Head of Research at Viral Spiral, the world’s leading management company for YouTube videos- including “Charlie Bit My Finger”, the most viewed viral video of all time. I’m writing on behalf of Good Morning America and ABC News. We absolutely love the video you posted on YouTube showing “Baby Penguin meets human for the first time,” ([http://www.youtube.com/watch?v=GdmQ9nMkI-g]) and we’d like to share it with our viewers! We would like to request permission to show this video on GMA (and across our ABC News shows and platforms, which is seen worldwide and on all media). I replied in the affirmative and answered the follow up questions around ownership. I work with Yahoo! Video and we are interested in featuring your video where you meet the penguin. We want to feature it on Yahoo!’s Network (Yahoo’s owned, operated, and partner websites, applications, programs and services using Yahoo’s embeddable video player). This email is our request to use your Video. If you agree to grant Yahoo! an irrevocable, world-wide, non-exclusive license to exhibit your Video, by any means and in any media, on Yahoo!’s Network, please reply to this email with the term AGREE in caps. Since this wasn’t going to be exclusive, I didn’t see why not. Purchasing the rights, sounded much more involved, and I was just beginning to enjoy the viral parts of this… why sell? 6. Clicking Youtube’s watch page vs. Embed player. Click on the words embedded player for much more detailed referral statistics, but also note more than half of all views make it through the watch page. Now we can clearly see the video was picked up on all sorts of sites, and while the numbers may still not add up to 116,000 it’s a good start. In the analytics we can see the referral information as well as it relates to Youtube itself. While the users may mostly be using the YouTube player, the vast majority of referrlas are coming from outside travel including mobile, and many many referrals outside of YouTube. We get an idea of who those people are by looking above. As well I look at likes, favorites, and watch closely on percentage of likes to dislikes. You want to keep the ratio high. The video went mainstream. Home page of Yahoo! Discovery, Fox News, Fox News TV on “Red Eye,” KSL News Radio Interview with me about my video (radio program here in Utah). It’s been on TV in Japan and Costa Rica as per friends in those countries. Just got an email from Nickelodeon. My channel is up to 600,000 views. This includes the 100,000 prior to the penguin release. Traffic has slowed down, but that is bound to happen. Now it’s much more selective conversations on bigger deals. I’m also learning a lot about monitization on YouTube. I hope to have a post on the results of those tests. Update I debate how I should have handled the promotions. It seems the ads seem to discourage sharing. For this reason I have been considering turning off ads across all of my vids. I’m up to over 800,000 views on the baby Penguin video. Amazing. Hi Joel, many thanks for explaining your success with your Viral Baby Penguin video and the emails requests you got from it. I found your blog style wonderfully easy and yet enlightening way for readers like myself to understand a little bit more about what it means to go viral, thanks. Look forward to more video’s in the future. Enjoy yourself. Great Video. Now that you’re famous I think a site redesign is in your future. What you don’t like my theme? I’m open to suggestions. so happy to see that video is being seen around the world!! Congrats Joel! Thanks for sharing your comments Elena. Seems like you’ve been able to see this blog go from obscurity and into the viral limelight with this baby penguin video. I know! Love seeing you getting all the press you deserve! Long overdue if you ask me.. Go Joel! Thanks for sharing it. Made me smile.